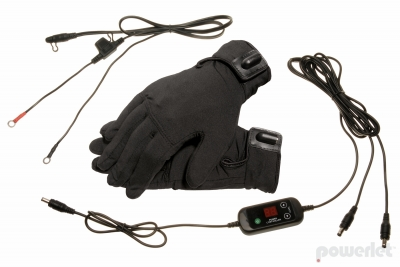 Our RapidFIRe Heated Glove Liner Kit is the surefire solution for cold hands. A complete package with everything you need to hook up to your vehicle, Glove Liners, 5 Position Digital Controller with glove leads, and Powerlet Lanyard. Includes controller. Designed for commuting, touring and extending your riding season, Powerlet® heated gloves will provide years of pleasure. Style, comfort, protection, and warmth. Perfect. 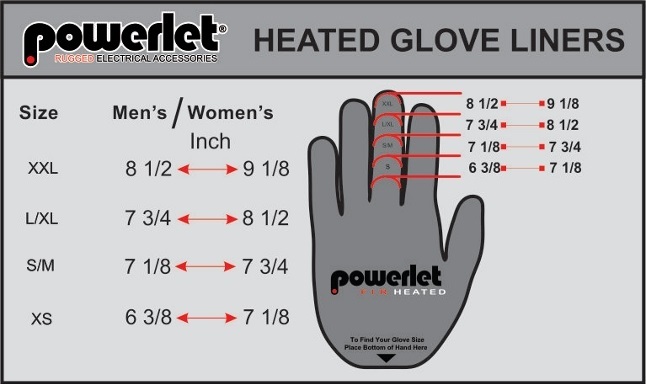 Every heated glove goes through our multi-point inspection process before earning the privilege of carrying the Powerlet name. We inspect internal wiring, connectors, bench meter amperage and resistance testing before labeling and packaging our gloves. Details matter; we believe in delivering you the highest quality product for your hard-earned money. Perfect for all motorcycles, even those without much excess electrical capacity to power appliances. ProForm heated gloves gloves are rated at 24 watts per pair. Stay warm and stay safe while minimizing your electrical consumption. Powerlet seeks the highest quality materials and craftsmanship. All of their heated clothing products are developed and tested in the USA by people who ride regularly. Quality components and attention to detail ensure Powerlet products resist wear and corrosion to last a lifetime. All Powerlet RapidFIRe heated clothing carries a lifetime warranty on the electrics and a lifetime warranty on manufacturing defects. We strive for superior quality standards. In the event you have a defective product, contact their sales department for a replacement at sales@powerlet.net or phone Powerlet's toll free number 877-752-7835.